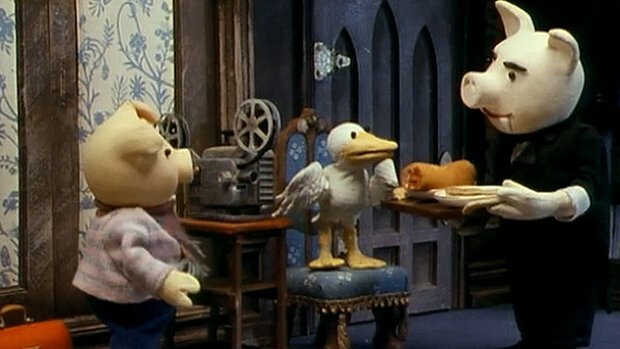 When granny sends Huxley Pig an optical toy he is soon dreaming that he is filming Sam at Lady Agatha's home, The Manor. Sam's tap dance soon awakens Horace who tries to get rid of them before Lady Agatha and Cuddles arrive. Huxley takes some film of everyone until Cuddles spots "a huge worm". Sidney, the snake, has escaped from the local zoo but is invited to stay. Meanwhile Huxley discovers that 3 cream cakes are missing from his lunch box but, as Lady Agatha asks everyone to tea he doesn't pursue the matter. Vile Vincent, the butler, is delighted to meet another movie buff, he is such an enthusiast that he offers to process Huxley's film there and then. During the film show that follows it is discovered that Huxley has shot Horace stealing his cakes.